Hello, thanks for popping in for a visit. We were up early yesterday to participate in the Veterans Day Parade in Portland's Hollywood District with my Portland Chapter of the Daughters of the American Revolution. We were lucky to have a sunny day, but it was cold and VERY windy, in fact there were trees blowing down all over town! Dayle donned his 1st Cavalry hat that I got him a few years ago. The guy in the middle is wearing an American Revolution uniform portraying a Continental soldier, and on the right is my sister Roberta's husband Ted, dressed as a frontiersman in leather. We decorated my new car, but we stopped short of using duct tape to put more decorations on it.. :-) The wind was flipping our string of buntings up.. I designed and ordered this magnetic sign for Dayle a few years ago. He got a lot of "Thank you for your service!" greetings along the parade route. These ladies from the Patriot Pin Ups were right ahead of us in the parade. I always organize a group photo, here is our group, 3 DAR groups from the area, the SAR (Sons of the American Revolution) and Dayle, my veteran. The SAR guys, aren't they handsome? More people in the parade. The bad part of being IN the parade is that you don't get to see the rest of the marchers and vehicles. This is the Portland Chapter group - the intrepid ones that participate in the parade! Every year on this corner is a group of pre-school children, they are learning patriotism from a young age! I got this photo while Dayle steered as we rounded a corner - my best vantage point for getting the rest of the parade ahead. Our group included the ivory white Mustang ahead and leading are all the red-jacketed chapter members carrying the banner. I love this old theater, which gave the community it's name. The Hollywood District. This is the ribbon we were given for participating in the parade. I have quite a collection of them now! This is my Dad when he was a young Marine. 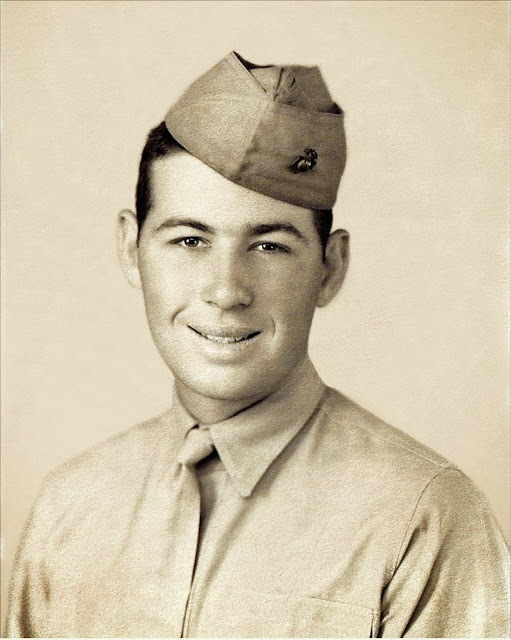 He went in on the first wave at Iwo Jima and was there for 3 weeks. Approx. 240 of his company went in and only 17 walked out, uninjured. A terrible war there. He was a loving father and I miss him a lot. This is my husband Dayle after he returned from Vietnam, where he was shot in the femur while flying a scout helicopter. He was in traction for months and then in a whole body cast after that. We are so thankful he made it home ok. He's been our hero. I really enjoyed the photos of the parade. Looks like an impressive event. Very nice shots of your dad and husband in their uniforms! What a nice event. My dad is SAR but I don't think he's ever been in a parade. He would enjoy it, though. I loved seeing Dayle and your father in uniform, those are great treasures. Thank Dayle for me. thanks for sharing photos of the veterans day parade. Looks like fun! I went to the one in Albany for years with my family. About 4 years ago or so, I actually was in the parade with PGR riders at the beginning of the parade. That was fun. Hope you stay warm where you are in the gorge area..supposed to be cold there. It's near freezing here already, took a bunch of plants into the garage after I got home from work tonight! Take care! I do my dear friend I appreciate and I have an immense respect for the work they did and I'm forever thankful for all that Dayle ( for example) suffered to keep as safe and preserve our freedom. My husband was in the Air Force for 10 years and I'm grateful every day he didn't get hurt. Tell Dayle "Thank you so very much for his service" for me. Great pictures! How wonderful Teresa! Such a neat thing to do! Your Dad and Dayle, so handsome in their uniforms! My father in law was a LT. Colonel in the AF. He was navigator and flew many missions, where so many didn't come home. So thankful for all of our men and women in the armed forces!! What a fantastic parade, love the costumes. My father was called up towards the end of WW2 so didn't see active service overseas, but helped to de-fuse ammunition over here in the UK. He was in a reserved occupation (engineering) but as the war went on even he and his colleagues got the call. My grandfather served in WW1, he was gassed in the trenches, and lost a lung. 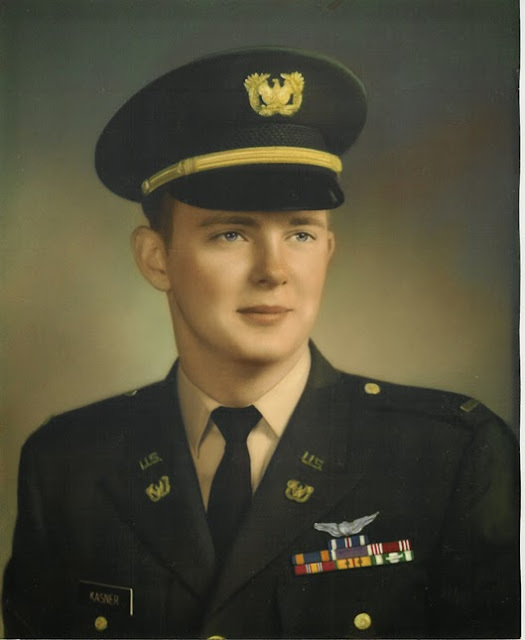 My uncle was killed in the Korean war, he was just 21. So 11 November is always a very moving day for us. What a wonderful parade, a great tribute. My husband and I both served in the Army, I did 7 years until I married , my husband did 22 years service. What a fantastic parade. Such handsome men you have in your family!! What an amazing way to spend the day Teresa. Give Dayle a special hug from me. How wonderful! Our community celebrates many days and season with parades but not one on Veteran's Day... perhaps it's time to start! Lovely post Teresa. Thank Dayle for his service for me. Thanks for sharing Teresa, your men look so handsome.